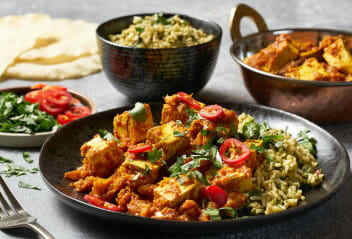 The famous Balti is a traditional one-pot curry from India that oozes flavour and feel-good aromas. 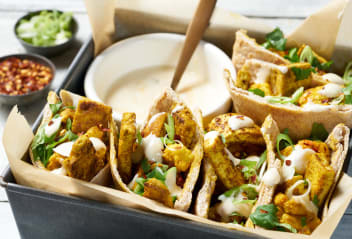 Our vegan version of the classic dish is quick and simple to cook and features a winning combination of tofu and cauliflower. 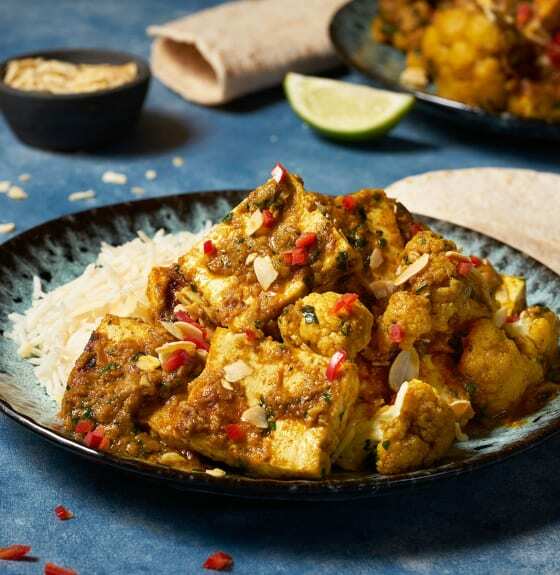 Serve with basmati rice and flaked almonds for a comforting curry night in! 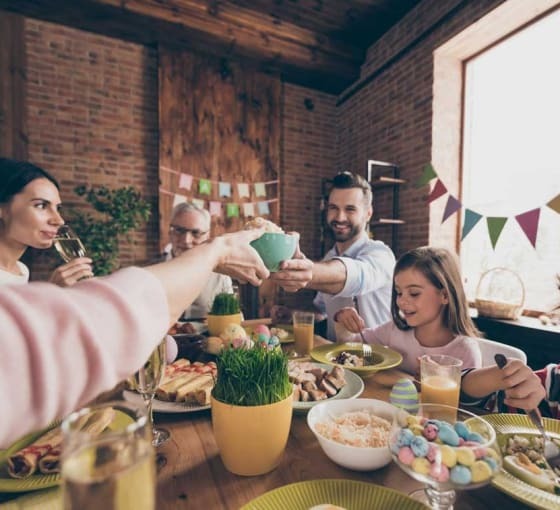 Drain the tofu for 20 minutes by placing it in-between two chopping boards lined with a clean tea towel or kitchen roll. Put something heavy on top, e.g. food cans, to apply pressure. Once the tofu has been pressed, chop in to 4cm cubes. Dust in gram flour and fry in 1 tbsp of oil for 5 minutes, turning once, or until golden. Drain on kitchen towel and set aside. To make the curry paste, dry fry the coriander seeds, cumin seeds, mustard seeds, fennel seeds, cardamom pods, cloves and bay leaves over a medium heat for 1-2 minutes, moving continuously. Transfer these to a spice blender and blitz until smooth. Put the spices in a mixing bowl, add the turmeric, curry powder, ground ginger, tomato puree, vinegar, coconut oil, garlic and ginger, and stir into a paste. For the curry, place 1 tbsp of oil into a pan on a medium heat. Add the curry paste and cook through for 3-4 minutes. Add the tofu and cauliflower and cook for a further 3 minutes. Add the vegetable stock, salt and pepper and continue to simmer for a further 10 minutes. Finally add the garam masala and fresh coriander and stir through, cooking for a further 3 minutes. To serve, plate with the basmati rice and garnish with the toasted flaked almonds. 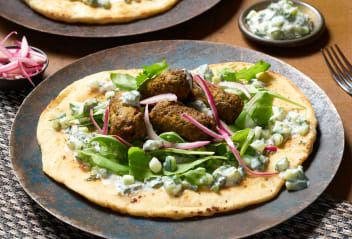 Look forward to lunch with these light and flavourful Indian Kofta Flatbreads. The soft and fluffy vegan coconut flatbreads are also ready in a flash! Great for sharing or snacking on with friends, these tasty pittas will be gone before you know it!